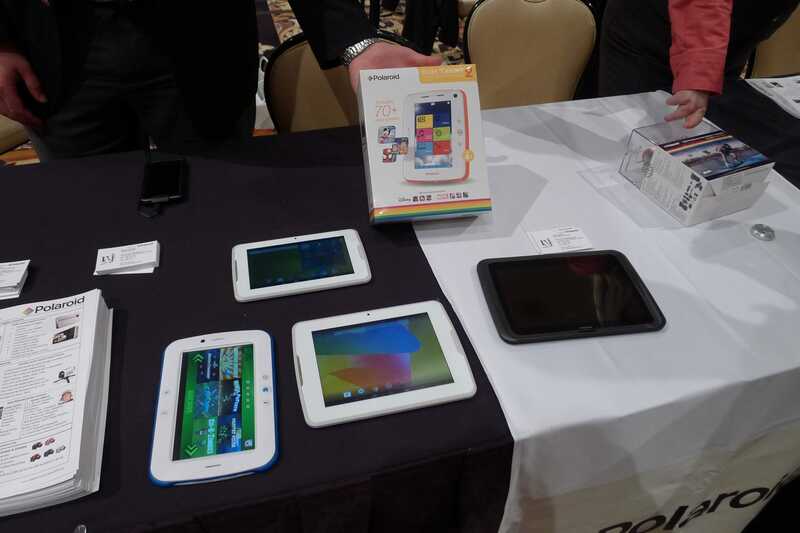 Polaroid has been slapping their brand on OEM budget tablets for the past couple years, and they were back again this year with a several new models. In addition to a new quad-core kids tablet which is due out later this year, Polaroid also showed off acouple models their new line of Q tablets. These 3 tablets will be budget priced when they hit the market later this year and feature 1.6GHz quad-core CPUs, Android 4.4, and at least one camera (the Q8 and Q10 will have 2 cameras). These tablets look much like your average budget tablet, but they are thinner than last year's models and have a prettier design than most. In addition to the HDMI port, 8GB of storage, camera, microSD card slot, the tablets also have a pleasant rubberized shell with a stylish accent stripe across the back. They were pretty zippy, though of course I didn't have much time to play with them (and it was noisy at the trade show, too). And as you can see in the photos, the tablets do have the front-facing speaker mentioned in the press release. I wasn't able to confirm the quality, but simply having the speaker is a point in these tablet's favor. I can't tell you the number of tablets with muffled rear speakers I have used over the past few months; it's one of my pet peeves. The photos above include the Q7 and Q8; the Q10 was not there. These 2 tablets will retail for $129 and $179. I also got a chance to play with the M9, a quad-core 4G-equipped tablet that Polaroid showed off last year which has yet to hit the market (or at least I cannot find it). At that time the M9 had a dual-core CPU, but I'm told it will have a quad-core CPU when it ships later this year (I would double check that before you buy one). I couldn't get any details on the connectivity or hardware specs for the M9, but I did get business cards and a promise of more details when the tablet ships. Even with the battery required to support the 4G chip, this was quite the thin tablet (even more so than the Q tablets). Unfortunately I couldn't get details about the price, either.